Ahh, the souffle. I really should be entitling this “The Grand-Amazing-Tower of Perfection Souffle”, but I figured I would keep the post short and to the point. 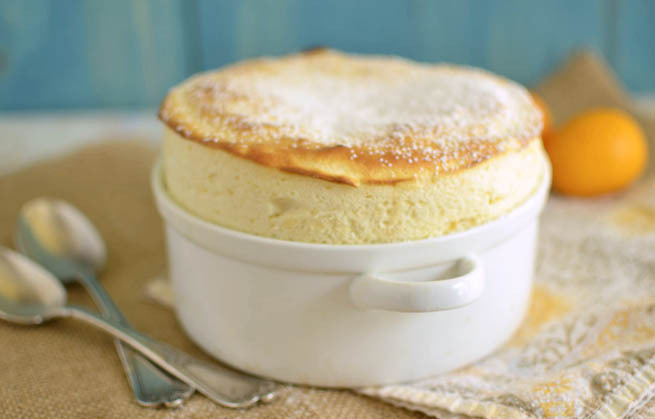 Souffle is deemed the masterpiece of technique and the damsel of all things baking. The souffle is fragile, beautiful, delicate and oh so temperamental. For my 2nd souffle, I had to illustrate the same patience and technique as with my first one. I have to admit, I was pretty scared and yes excited, to make this sweet souffle because well..it was my 2nd one. I did so well with my first try that I didn’t want to “strike out” if you know what I mean. I already had a “I accomplished this” and didn’t want to ruin a good thing, get my drift? But..I am a dare devil and conquered what I sought after. The trick, as with both of the souffles, is the tin foil collar. 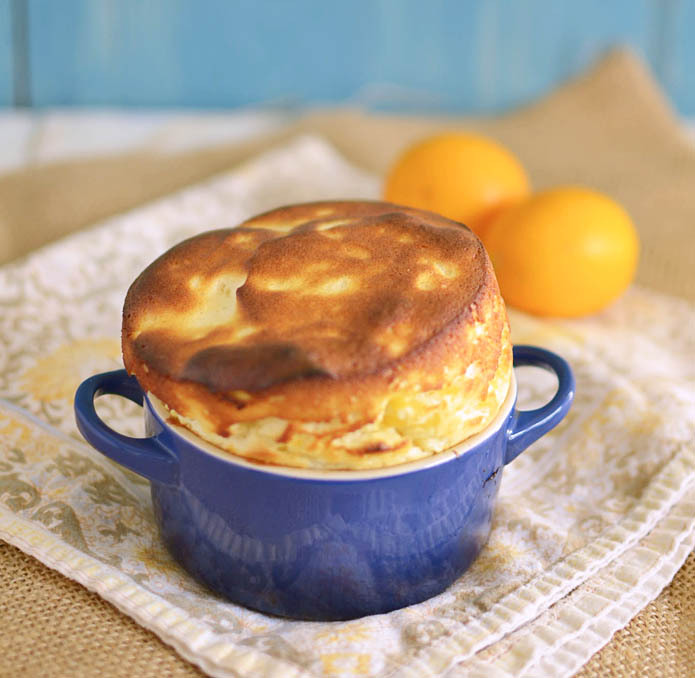 I initially got this idea from Julia Child and it is the key in making a grand souffle. The collar helps guide the souffle over the mold and holds it up and in my case, you have a few extra minutes to snap a few photos before it begins to sink. Score! 1) Pre-heat oven to 375 degrees F and position oven rack to the lower 2/3. 2) Make the lemon cream: In a medium pot, whisk together the egg yolks, milk, lemon juice and zest, cornstarch, sugar and salt. Over medium heat, whisk until the mixture begins to bubble, about 3-4 minutes. It will continue to get thicker, but constantly whisk it. Continue until it is very thick. 3) Turn heat off and whisk in the butter and vanilla extract. 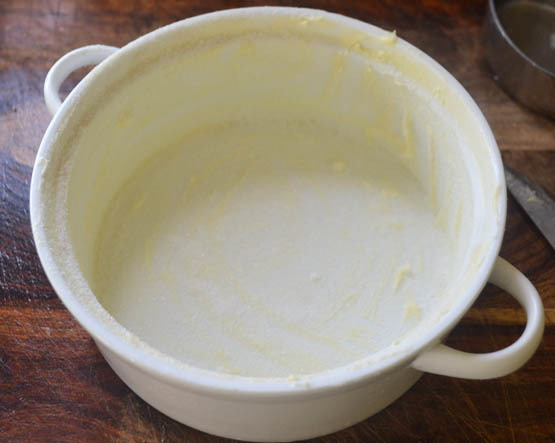 Transfer the hot cream mixture to a large bowl filled with ice to help cool down the mixture. Whisk every few minutes until it gets to room temperate. 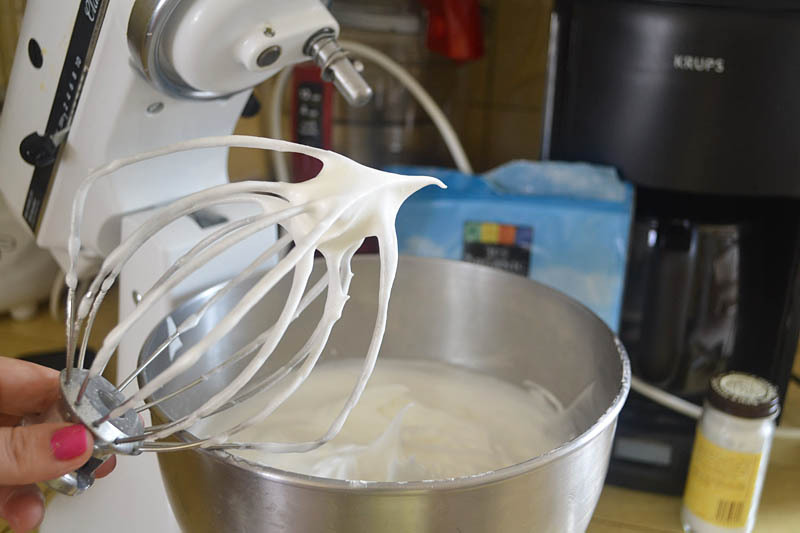 4) Make the meringue (egg whites): In a stand mixer fitted with a whisk attachment, add egg whites. Start on low and work to medium speed. 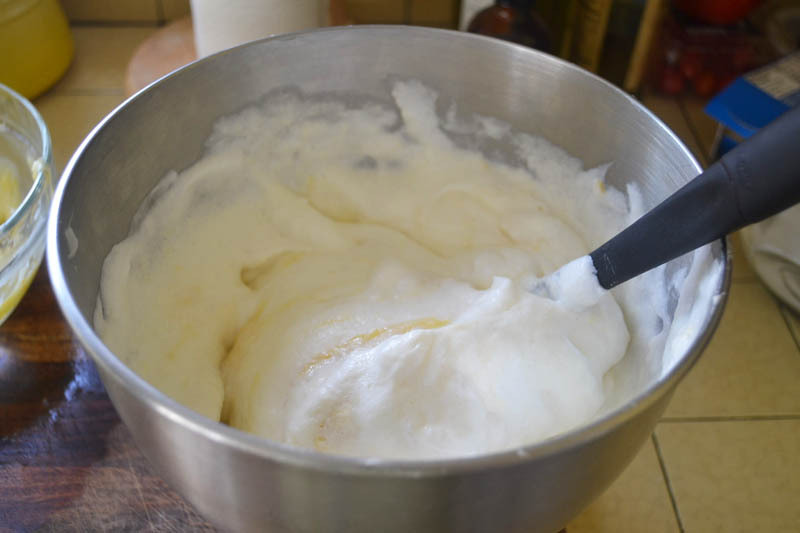 You will see the egg whites begin to “break up” and start to get foamy. Add cream of tartar and continue whisking. 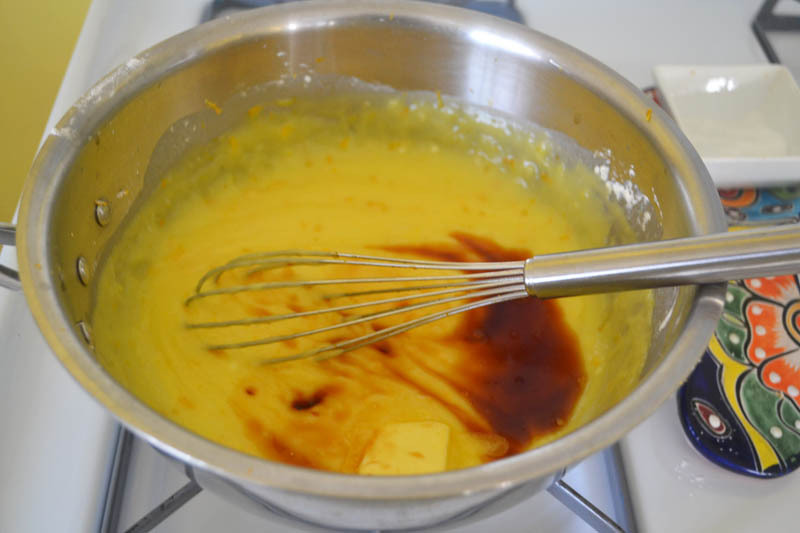 5) Continue whisking and gradually get a little faster. When whites are starting to form and are at “soft peaks” add confectioners sugar slowly, about 1Tb at a time while the whisk is going. Continue whisking until “stiff peeks” form. 6) Next, place the egg whites and pastry cream bowl next to each other. 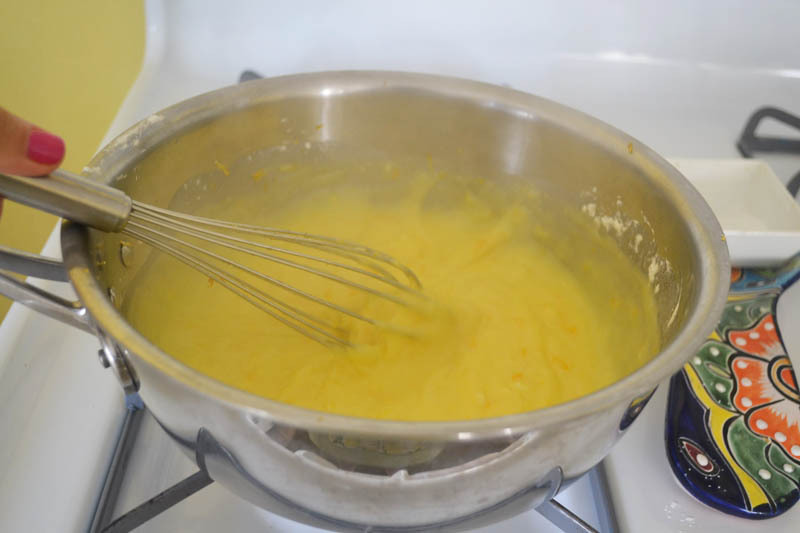 Using a large, soft spatula take a large dollop of cream mixture and add it to the egg whites. Do not mix heavily, you want to FOLD it in. Fold by taking your spatula to the side0under-up. You will see streaks of yellow and continue folding gently. Add the rest of the cream mixture about 1/2c at a time until incorporated. 7) For the molds: Grease a 6cup mold with softened butter all over and dust with powdered sugar. *This recipe is enough for a 6cup mold plus 2 small individual molds. 8) Make the collar: Tear a long enough piece of tin foil that is long enough to wrap around the mold. Fold in half so it is not “too tall”. Grease the inside of the foil with butter and wrap around mole, securing at handles. 9) Pour the souffle mixture into the dish and level off the top. 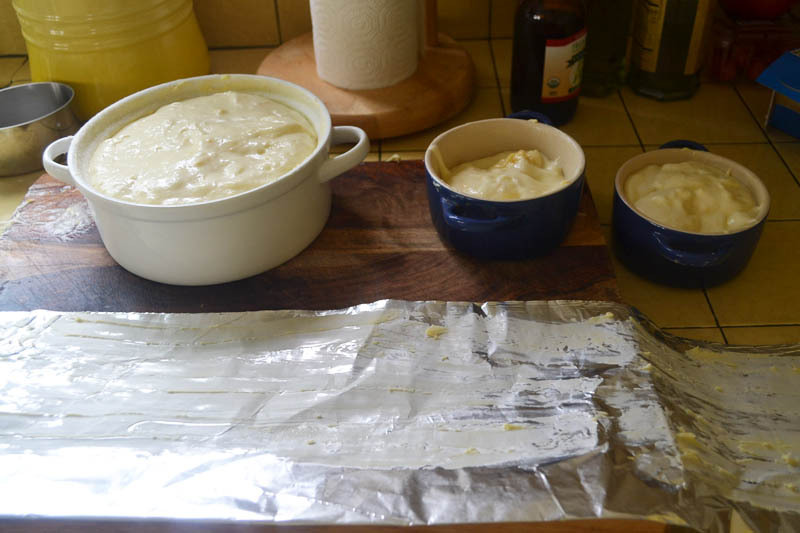 Wrap the foil around the mold. (Easier after your pour mixture in). 10) Bake at 375 for exactly 20 minutes. No peeking! When done, dust with powdered sugar. Pre-heat oven to 375 degrees F and position oven rack to the lower 2/3. 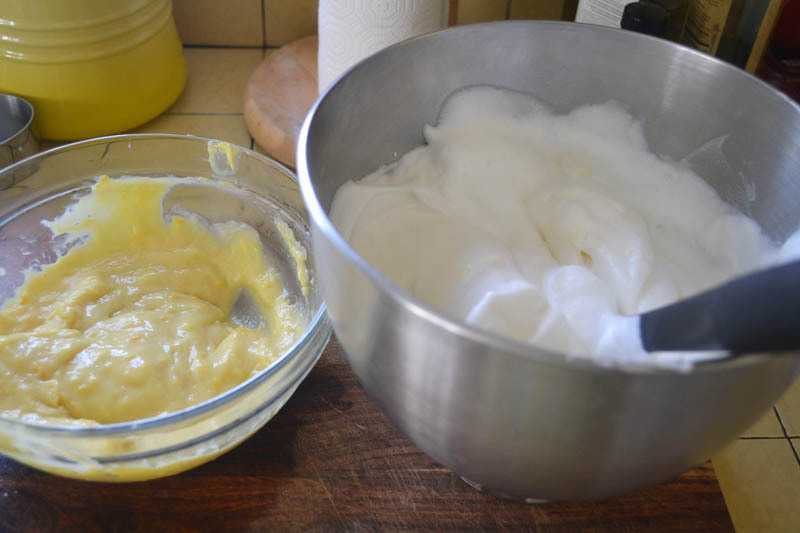 Make the lemon cream: In a medium pot, whisk together the egg yolks, milk, lemon juice and zest, cornstarch, sugar and salt. Over medium heat, whisk until the mixture begins to bubble, about 3-4 minutes. It will continue to get thicker, but constantly whisk it. Continue until it is very thick. Turn heat off and whisk in the butter and vanilla extract. 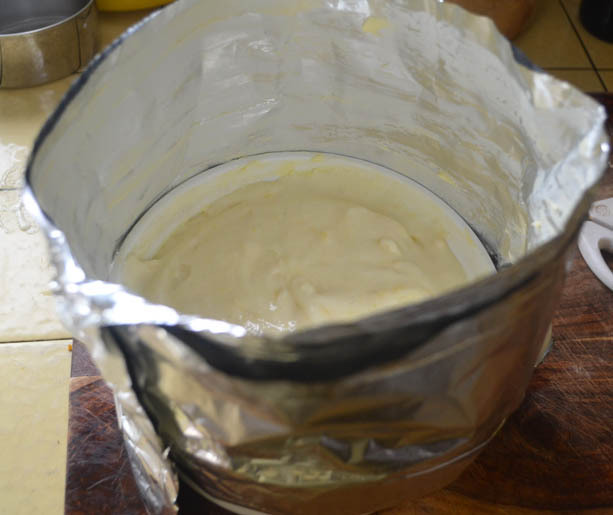 Transfer the hot cream mixture to a large bowl filled with ice to help cool down the mixture. Whisk every few minutes until it gets to room temperate. 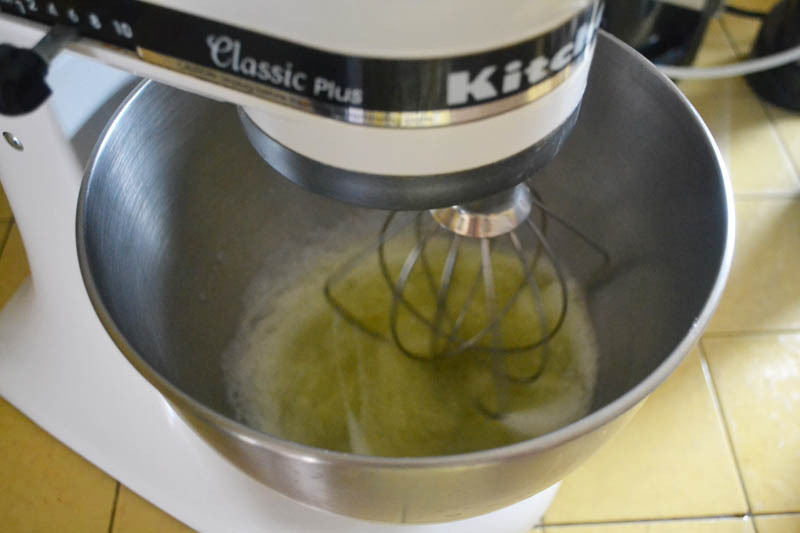 Make the meringue (egg whites): In a stand mixer fitted with a whisk attachment, add egg whites. Start on low and work to medium speed. 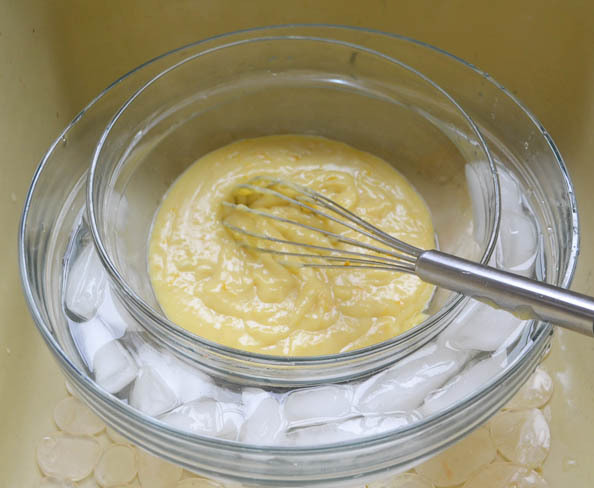 You will see the egg whites begin to "break up" and start to get foamy. Add cream of tartar and continue whisking. Continue whisking and gradually get a little faster. When whites are starting to form and are at "soft peaks" add confectioners sugar slowly, about 1Tb at a time while the whisk is going. Continue whisking until "stiff peeks" form. Next, place the egg whites and pastry cream bowl next to each other. 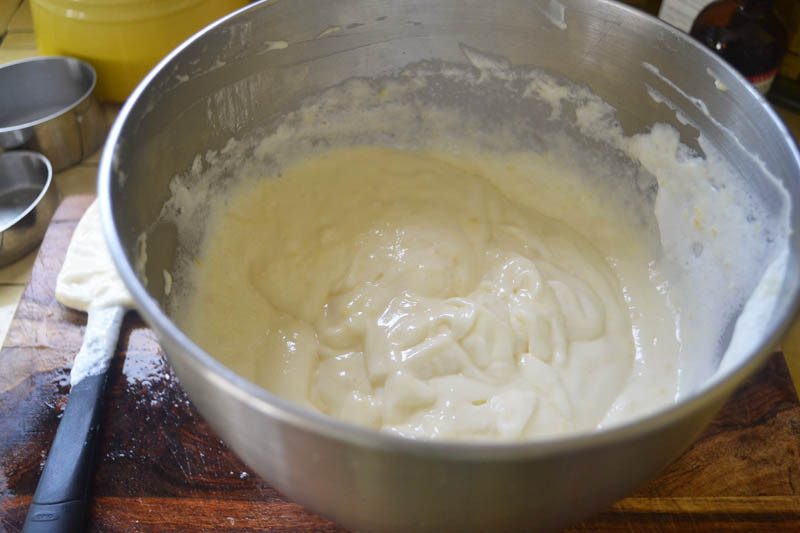 Using a large, soft spatula take a large dollop of cream mixture and add it to the egg whites. Do not mix heavily, you want to FOLD it in. Fold by taking your spatula to the side0under-up. You will see streaks of yellow and continue folding gently. Add the rest of the cream mixture about 1/2c at a time until Incorporated. For the molds: Grease a 6cup mold with softened butter all over and dust with powdered sugar. Make the collar: Tear a long enough piece of tin foil that is long enough to wrap around the mold. Fold in half so it is not "too tall". Grease the inside of the foil with butter and wrap around mole, securing at handles. Pour the souffle mixture into the dish and level off the top. Wrap the foil around the mold. (Easier after your pour mixture in). Bake at 375 for exactly 20 minutes. No peeking! When done, dust with powdered sugar. Enough for a 6 cup mold + 2 small individual molds. These are so beautiful! Perfect springtime dessert. I’m all about the lemon right now and this looks perfect! Have you read Tender at the Bone? Ruth Reichl has a lemon souffle in there that looks awesome. I think you should have entitled the post “The Grand-Amazing-Tower of Perfection Souffle” because it looks like you nailed the recipe like a boss 🙂 The foil is a really cool tip. I don’t make souffle often, but will have to remember for next time. Thanks for sharing the recipe and great cooking tips. Hahahaha OMG thanks so much Trevor!!! Seriously made my day. Ya..now I need to make a 3rd souffle ASAP! Stunning, I remember how gorgeous your Julia Child souffle was too, way back when!! Sharing on Sulia!!! Where is the granulated sugar used? Hi Sarah! Sorry about the typo, it should go in with the lemon juice and zest, cornstarch, salt, etc to make the lemon cream! 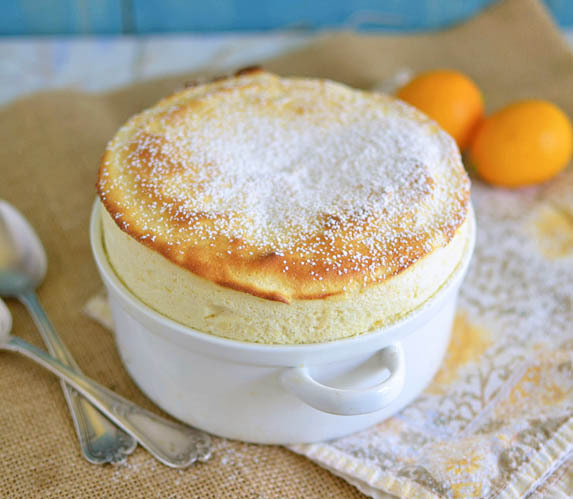 I love meyer lemon souffle, it’s so delisious, It combines two of my favorite things – lemon and milk!